Haven’t jumped on the smart home bandwagon yet? Don’t yet understand why products like smart bulbs and speakers with digital voice assistants have grown in popularity? There are a lot of arguments for turning your house into a smart home. You can save on energy consumption, automate irritating daily tasks, and make life a little bit easier for everyone. Smart homes can go far beyond the basics, though! With a little effort and creativity, and using the same common devices you may already own, smart homes can also be innovative, interesting, and beautiful. In this article, you’ll learn more about creative ways that experienced smart home owners use popular home products. These products include Amazon Alexa, Nanoleaf Aurora, Google Home, Philips Hue, and CleverPet. First launched in late 2014, the $180 Amazon Echo is a 9.25-inch hands-free wireless speaker you control with your voice Amazon Echo Has an Awesome New Wake Word Amazon Echo Has an Awesome New Wake Word Until now, Amazon's Echo has only had three wake words. They've just added a fourth, which is a real treat for Star Trek fans. Here's how to start using it. Read More . 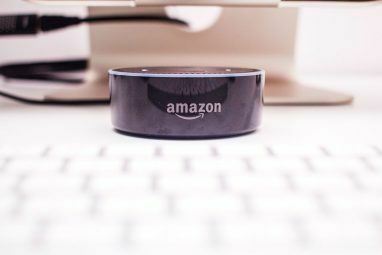 Thanks to the voice command technology called “Alexa,” what’s inside Amazon Echo is now available on other devices too, including the Amazon Fire TV, Amazon Echo Dot, and Amazon Tap. With an Alexa-enabled device in your home, you can perform many tasks. The following real-world examples showcase some original ways you can integrate Alexa into your lifestyle. 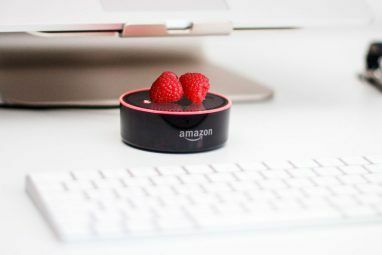 “Irish lad, video maker, baby maker & dog collector” Jonathan Saccone and his wife have an Amazon Echo positioned in the most important room in their home –– the kitchen. With the speaker they can order an Uber, purchase a gift card for an arriving guest, and learn the time for dinner. And, the video below is evidence that they can do all of this while carrying their two small children. Yoan Andreev uses Alexa’s home automation integration to control lights all around his house and the temperature on his spa heater. His video presentation gives you an idea of what Alexa can do and why buying smart lights might be a good choice, depending on your situation. Meanwhile, Instagram user Artnsole has a lot to say about food, today’s political scene, and more. For a little one in Artnsole’s family, however, it’s all about listening to Christmas music on Amazon Echo, regardless of the season. Whelp. We are approaching February. And we are STILL singing Jingle Bells. ?????????????? #AmazonEcho #WhatLoveLooksLikeToday #ChristmasIsOver ?? Amazon Alexa seems to get smarter with each new software update Alexa Can Now Order Takeout From Amazon Alexa Can Now Order Takeout From Amazon You can now order a takeaway meal from Amazon Restaurants using nothing other than Alexa and your own voice. Which is perfect for those people who are too lazy to cook. Read More . It can now respond to thousands of questions and commands 20 Echo Skills That Show Alexa's Not Always So Smart 20 Echo Skills That Show Alexa's Not Always So Smart Despite all the things that you can do with Alexa out of the box, its extensibility via Skills is far more intriguing. Here are 20 Echo Skills that may surprise you! Read More , big and small. YouTuber PhoneBuff showcases 50 random questions Alexa has answers for, including how many calories are in a slice of pizza, whether aliens are real, and more. 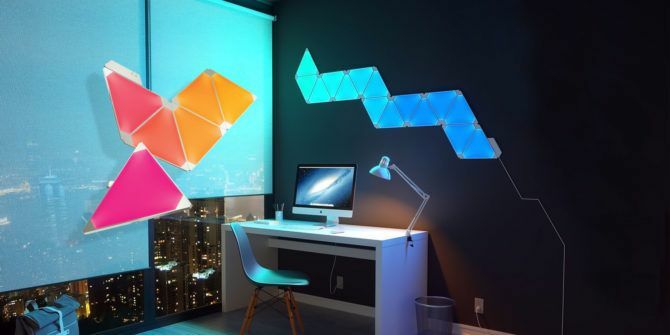 The $200 Nanoleaf Aurora is one of those smart products that you have to see to believe. 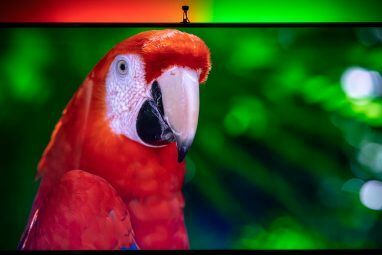 It’s a modular LED panel lighting system that lets you experiment with light in fun, imaginative ways. The Aurora Smarter Kit comes with nine triangular panels, which you can connect to form different designs either on a wall or another surface in your home. You can connect up to 30 panels to the same power kit, as demonstrated in the following examples. From Switzerland comes this playful post from Dom~Domenico. As you can see, his Aurora is both sophisticated and colorful, acting as an interactive art installation. Even his monochromic furry friend appears to love the new lighting artwork! Santa is to thank for Thea Shannon’s new household toy, calling the Aurora the “Best Christmas present ever! Still so much fun!” Their design shows that there are limitless opportunities to be creative with this smart home product! Ready to see an Aurora in action? Take a look at this video from J. Estrada and notice how the lights are in constant motion. They’re controllable via the free Nanoleaf app. You can also control the lights using Apple HomeKit and Siri Alexa, How Does Siri Work? Voice Control Explained Alexa, How Does Siri Work? Voice Control Explained The world is moving towards voice commands for everything, but how exactly does voice control work? Why is it so glitchy and restricted? Here's what you need to know as a layman user. Read More , Amazon Alexa, or Android. Finally, if you like Aurora’s look, but would rather not put it on your wall, consider this idea from Dong Wook. His lights sit on his livingroom coffee table for an interesting effect. This is also a great option for renters, who may be hesitant to put marks on an apartment’s walls! #??? #??? #????? #???? #nanoleaf #myaurora #??????? First introduced in late 2016, the $129 Google Home is Alphabet Inc’s answer to the Amazon Echo Amazon Echo vs. Google Home vs. Apple HomePod Amazon Echo vs. Google Home vs. Apple HomePod In this article, you'll learn the differences between the Amazon Echo and Google Home. We'll also take a look at what features an Apple speaker may include. Read More . The oddly shaped device looks a lot like a two-toned air freshener. Like Alexa, Google Home offers a voice assistant to answer your questions. Aptly named Google Assistant, the speaker uses natural language processing, intended to improve reliability. Google Home is certainly chatty, and it also likes to play music, as it’s compatible with Google Music, YouTube Red, Spotify, Pandora, and TuneIn. Here are some interesting ways that others are using the device. On the integration side, Google Home loves playing with Samsung’s SmartThings and other smart products. In the following video, Keith Credendino demonstrates how his Google Home works with SmartThings, IFTTT, and Harmony Hub. Philips Hue is the leader in smart lighting technology 4 Ways Philips Hue Can Push Your Lighting to the Next Level 4 Ways Philips Hue Can Push Your Lighting to the Next Level Without Philips Hue, however, the smart home concept might never have gotten off the ground. Here are some cool ways to make use of them. Read More . Its lineup of smart bulbs (prices vary), and other lighting accessories can change the look of a room with a few presses on your iPhone or by using your voice with Apple HomeKit or Amazon Alexa. What I’ve always liked about Philip Hue is its ease of use. Just plug in the hub to your home’s Wi-Fi, begin adding lights, and you’re ready to go. Here are some examples of how others are using this technology. One of the advantages of using Philips Hue is its ability to sync with your tunes. YouTuber Big Wax takes full advantage of his lighting system in the video below. In the below image from Axley T, you can’t even see the Philip Hue bulbs. Instead, this image shows how adding a few well-positioned lights can add color to a statement piece in your home. In this case, they certainly add new dimensions to to a featured piece of art. Finally, Adrian Black The 7 Best Philips Hue Apps for Android and iPhone The 7 Best Philips Hue Apps for Android and iPhone Looking for the best Philips Hue apps to use with your smart lights? Here are several great apps for iPhone and Android. Read More explains how easy it is to combine Philips Hue with third-party apps The 7 Best Philips Hue Apps for Android and iPhone The 7 Best Philips Hue Apps for Android and iPhone Looking for the best Philips Hue apps to use with your smart lights? Here are several great apps for iPhone and Android. Read More , thanks to its many integrations. This video is a great example of how experienced smart home owners individualize their lighting set-ups to best suit their personal needs. Finally, we’ll round out your smart home tour with a smart home device that will keep your pets happy and you smiling. It’s the CleverPet, an automatic dog feeder that also acts as a toy. To get started, all you have to do is connect the CleverPet hub to your home network, fill the bowl with your pup’s favorite food, then step back and enjoy. The following are two hilarious examples of how your smart home can be set up not only to benefit its human occupants, but also your pets. Unlike Devo and Lucy, Ripley has already become a CleverPet expert. The dog is also a ham for the cameras, no? There’s a lot of smart home devices on the market, but the way you use them can vary greatly. Think of the devices themselves like building blocks — they have a lot of potential, but the look of the final product is entirely up to you! In this article, you learned a little bit more about five of those products from the people who use them every day in different ways. Which of these smart home devices do you hope to use soon? Have you come up with any innovative ways to use the products on this list? Let us know using the comments below. Explore more about: Alexa, Google Home, Pets, Philips Hue, Smart Lighting.